Whatever became of the mysterious St. Valentine? In the 1962 missal of Pope John XXIII, Feb. 14 was marked as the feast of St. Valentine. As closely as can be determined, Valentine was a priest of Rome who was martyred in the persecution under the Emperor Claudius, probably around the year 270. Legend says that Claudius had issued a decree forbidding his military troops to marry and that Valentine defied this decree by urging young lovers to come to him for the sacrament of matrimony. In the 1969 reform of the liturgical calendar, the church reduced the number of feast days of saints for whom hard historical facts were scarce, including St. Valentine. Q. Here is an actual situation. He was a priest in our parish. She was the divorced mother of four and our parish director of religious education. He leaves the priesthood and decides to marry her. They attend Mass together as a couple, and she keeps her job. Now, let’s discuss the particular situation that raises your concern. In the indult (“a permission, or privilege, granted by the competent church authority”) of laicization, there are normally particular types of work from which a former priest is excluded — principal of a parochial school, for example, or administrator of a parish. In the case you mention, the man is doing neither of these, nor is the woman precluded by her annulment from serving as a religious education director. However, you raise a valid point. 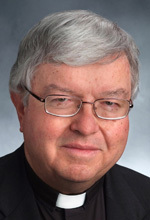 A laicized priest is commonly advised by the Vatican that he should avoid situations and places where his previous status as a priest is known — unless his bishop has determined that his continued presence will not generate scandal.